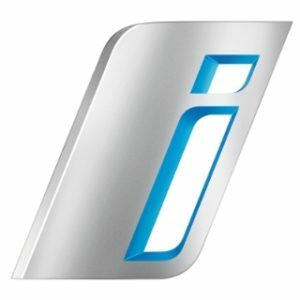 What Is BMW eDrive. BMW i Cars With eDrive. BMW eDrive is the electric drive concept made up from the electric motor, the lithium-ion battery and intelligent energy management. These three magic things work in tandem to create electric driving which is free from noise and emissions. BMW models with eDrive technology are endowed with magnificent dynamics, acceleration, mobility and sustainability. Electric motor is one of the high-tech developments BMW Group has ever done. BMW cars driven on electric mode with a fully charged battery show breathtaking performance on the road and have the range enough to travel most daily distances. With no local emissions and silent operation, BMW electric motor is capable to reach short bursts of speed required to overtaking a car in front. BMW eDrive technology intends to use a battery to power the propulsion of the electric car. The lithium-ion battery is an electricity storage device of high-performance, required for electric driving. To power its i-concept cars with premium quality batteries, BMW teams up with Samsung SDI. To minimize range/charge loss and enhance battery service life, the carmaker incorporated a cooling system in order to keep battery at optimum temperature rate. As to the charging, it is possible even at a conventional household socket. To charge the battery to its full capacity is also possible at public charge stations. For charging your BMW i model, BMW offers The ChargeNow mobility service. Use it when on the move to find the charging locations in your area, wherever and whenever you are right now. However, if you want maximum convenience, 100% safety and fast charging, there is an option to install a BMW charging box developed for home use. It can be mounted on the wall of the house and garage. It saves about 4 hours of charging time and protects from technical risks that may be caused by charging the car battery at a conventional socket. 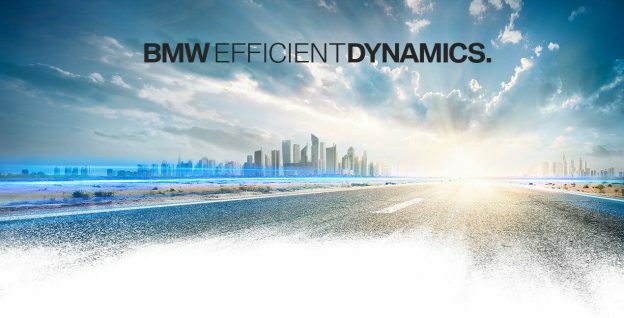 Intelligent energy management is one of the core technologies within BMW EfficientDynamics concept. Intelligent energy management is about balancing the relations between the electric drivetrain and the battery, and the electric motor with ICE. The task is delivering perfect performance with less power consumption. Depending on the route and driving situation, navigation data calculates the optimum time to start electric mode driving or battery charging; this energy management technology saves up to 10% of energy enabling the car to go longer distance on a pure electrical mode. The kinetic energy released during braking or deceleration is stored in the high-performance battery and is available when necessary to boost overall performance. To help the driver to increase electric range, there is the Eco Pro mode which additionally reduces power consumption, and the tips for efficient driving are shown on the control display. Founded in 2011, BMW i started to work on the two initial concepts: the i3 all-electric mega city vehicle and the plug-in hybrid sports car i8. The BMW i3, a locally emission-free car for city driving, became the first i brand model, launched in 2013. Year later, it was followed by the i8, as the most progressive sports car, packed with the internal combustion engine and the electric motor. Both innovative models have been developed with the principle of intelligent energy consumption and sustainable electric mobility. Both equipped with BMW eDrive technology units – the electric motor, the high-performance battery, and internal systems for the efficient management of energy flows within the car. The gorgeous plug-in hybrid i8 is the first sports car boasting the consumption and emission figures of a compact automobile. The mixture of eDrive system and petrol engine guarantee an efficient and dynamic driving performance. Comfort, Eco Pro, Sport and eDrive modes are available to adapt the car for current driving situation and road conditions. For purely electric driving, there is a magic eDrive button. Pure electric driving is possible at speeds of up to 120 km/h with eDrive. The Comfort mode with eDrive allows driving the i8 without support from the internal combustion engine until the battery is almost depleted. The ICE is activated at 60 km/h if the eDrive mode is not pressed. The energy released during braking or deceleration is stored in the high-performance battery and converts into electric energy to recharge the battery and boost car electric range. BMW i3 is the first car produced under BMW “Project i” and developed for pure electric driving. Powered by an all-electric drivetrain, this appealing car from BMW is designed to deliver emission and odour free performance at fully electric drive. This is a compact auto for urban driving and BMW’s first car featuring carbon-fiber-reinforced polymer to improve the energy consumption. BMW is offering a range extender option powered by gasoline engine with a small fuel tank. The engine engages when the battery level drops to a pre-specified point, and takes a role of a generator producing electricity to extend driving range. In this BMW i model, intelligent power management, the electric motor and high-performance battery from Samsung operate side-by-side to gear all car systems towards exceptional electric driving. This entry was posted in BMW i3, BMW i8 and tagged bmw edrive, BMW i on February 7, 2017 by bmwi. Looks like our generation is “driving” into the future where emission-free cars will be as a matter of course, and not the piece of luxury. The future where all-electric and plug-in hybrids prevail on the road. The future where everyone knows what is EV, PHEV, HEV, BEV, ER-EV, and takes it for granted. But as for now, electric cars are the matter of “woooooow!”, and a subject for photo shooting by every person going by or driving by on a traditional car. Most of happy owners of electric autos do not even imagine changing back to a conventional fuel car and traditional driving. But actually, most of average car drivers don’t know much about electric cars and are still fuzzy about electric vehicle types, engines and basic electromobility things. EV, PHEV, HEV – so what each of them is all about? Generally, there are all-electric cars (EV), hybrid electric cars (HEV), and plug-in hybrid electric cars (PHEV). This entry was posted in BMW i3, BMW i8, news and tagged BMW i, EV, HEV, PHEV on January 30, 2017 by bmwi. No driving experience and pleasure is possible without charging up your electric car. Charging BMW i electric car battery is no problem with BMW i charger installed at your home. Of course, BMW i car can be charged with the standard charging cable at a conventional household 240-volt socket. But if you want maximum convenience and fast charging, BMW EVs owners have an option to install the BMW i Wallbox, a charging box developed specifically for home use. It can be mounted on the wall of any house and garage. BMW i Wallbox is the charging device for electric and plug-in hybrid vehicles, developed to increase EV charging performance and reduce the charging time. With the wall box, charging your BMW i electric car becomes FAST, EASY, and SAFE. The BMW i Wallbox saves you about 4 hours of charging time and protects from technical risks that may be caused by car charging from a conventional socket. This entry was posted in BMW i3, BMW i8, news and tagged BMW i Wallbox on January 25, 2017 by bmwi. All-electric and plug-in hybrids are becoming more and more popular among the enthusiasts of green-tech cars. If you are one who believes electric automobiles are the future, then you’ll be probably curious of comparing the basic characteristics of these two high-end vehicles. Despite being in different categories, BMW i8 and Tesla Model S are quite interesting models to compare, as both are one of the most envied cars available today in the electric auto segment. Now let’s see how different these 2 are! This entry was posted in BMW i8 and tagged bmw i8 vs tesla on December 25, 2016 by bmwi. Without a shadow of doubt, for us, BMW devotees, BMW brand cars are amazing. Be it automobile exterior or interior. BMW is one of the leading car companies making the best cars ever. It comes as no surprise thereby that this progressive carmaker gave birth to new concept models with plug-in technology, the BMW i! BMW i is a company project, ground-breaking concept and BMW sub-brand, founded to deliver electric cars for driving pleasure in megacities. “Project i” cars are produced using sustainable and recycle materials. Maximum mobility and sustainability are main principles in BMW i concept. The goal of BMW is to use plug-in technology to keep offering high performance cars while reducing CO2 emissions. Lightweight, free from emission and noise, BMW i models are created to reduce air pollutions and power consumption. Designed for people who live in huge cities and crave for urban driving comfort, BMW i concept cars adapt to big city lifestyle and individual driver needs. This entry was posted in BMW i3, BMW i8, news and tagged BMW i, what is bmw i on December 19, 2016 by bmwi. 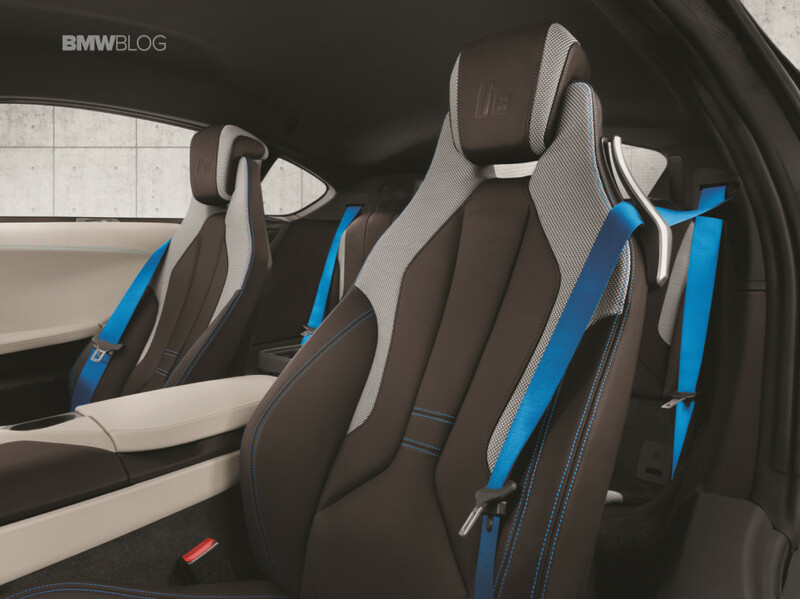 This entry was posted in BMW i8 on May 19, 2015 by bmwi. 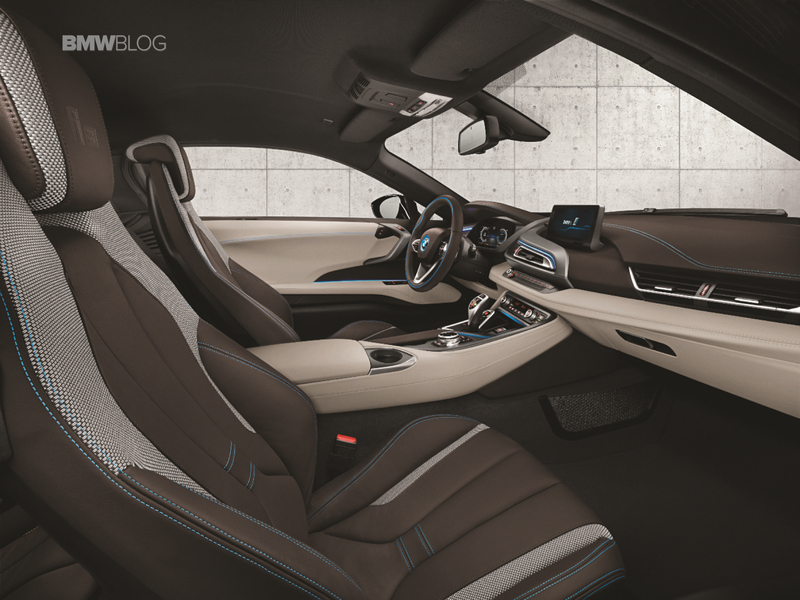 This entry was posted in BMW i8, news and tagged BMW i8, jaguar f type on August 26, 2014 by bmwi. During the Pebble Beach Concours d’Elegance, BMW i8 Concours Edition was sold for $825.000, around £ 493.000. The Concours Edition Car,that was the first of its kind sold in USA went for an exceptional price on the charity auction, because its value was originally estimated as $200.000 (£119.550). The profit that was gained at the auction went to the charity companies the Pebble Beach organisers support. This fall in USA will be officially launched the standard i8 that will be sold for $135.700(£81.000). The exterior of the BMW i8 Concours d’Elegance edition features “Frozen Grey” metallic paintwork. It was revealed during the week of events around Pebble Beach. 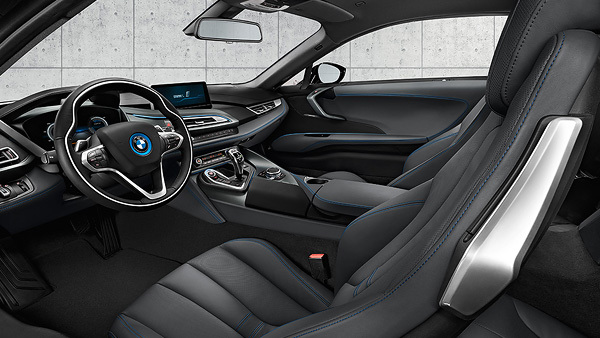 The interior of the Concours Edition is trimmed in brown leather with contrasting blue stitching and seat belts. The words ‘Concours d’Elegance’ are laser-etched inside with ‘BMW i8’ embossed on the front seats. In the rear of the car there is a plaque that carries the signatures of the BMW chiefs who made the idea of the hybrid sport car a reality. In the UK, the i8 is available already with the government’s £5000 EV grant, making its retail price £94.845. The i8 produces a total of 357bhp and 420lb ft of torque. Powered by a 129bhp electric motor in conjunction with a 1.5-litre turbocharged 3-cylinder petrol engine. Capable of sprinting from a standstill to 62mph in 4.4 seconds, the i8 has a top speed of 155mph. Official fuel economy is rated at 134.5mpg and CO2 emissions at 49g/km. This entry was posted in BMW i8, news on August 19, 2014 by Petrov Gabriela. 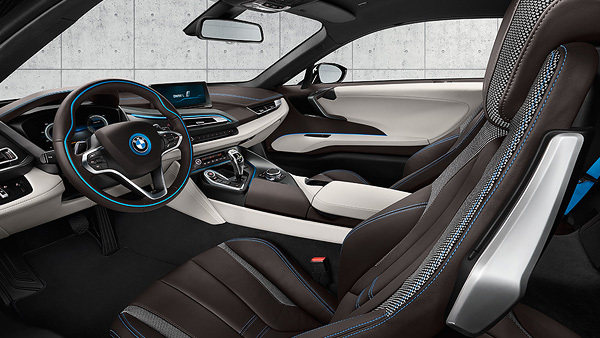 In the last article I promised to reveal the three interior designs of the BMW i8. So here we are. Sustainable, sporty, modern and luxury vehicle is a reflection of the future in its design, colors and interior materials. 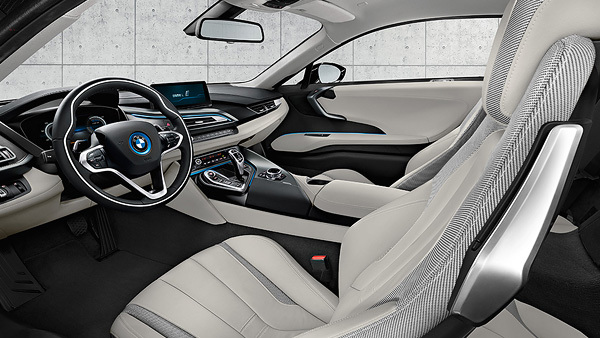 NESO, CARPO, HALO are the three interior designs that are offered by the BMW Group. Each of them is exclusive and spreads the sustainability concept. Their creation is based on the lightweight, recycled materials in the interior and the leather has been tanned with olive leaf extract. The best representation of the future sporty mobility is the design NESO. The feeling of well-being is maintained by the recycled materials, clear contrasts and highlight materials in the doors and side panels. The sustainable concept of the BMW i8 is clearly underlined. The modern effect created in the interior of the NESO design is based on the extremely light Spheric leather in light Carum Grey. They complement the black Exclusive leather surfaces and black Nappa leather. All the interior elements have a clear, light, sustainable, modern air. CARPO full-leather equipment gathers crafted light Spheric leather for the seats covers, including some accents of black Exclusive leather on the instrument panel and on the inner door part Nappa leather. The colors used for the steering wheel accents are Pearl-Gloss Chrome and Satin Silver, there are also some lacquered accent surfaces in dark grey Amido Metallic. CARPO is available in two verisons. One version is with Ivory White thrives on the constras of colors with the black surfaces in Exclusive leather. The lightness and the transparency in the interior is underlined by the light leather surfaces in the doors, on the instrument panel and on the seat, that are dynamically curved. The second version has leather in the anthracite-colored tone of Amido, the combination with the Exclusive leather. The full-leather equipment combines an aspiration with natural aesthetics. The leather of Dalbergia Brown is tanned with plant extracts, it has accents in Carum Grey. In the HALO design there are some connections made with BMW i Blue on seat belts, the steering wheel made of leather, on stitching. This connections underline the luxury and the slimline in the interior. There is a interesting contrast on the doors between light and dark, on the side panels and the instrument panel. Another accents are provided by the Amido Metallic. This entry was posted in BMW i8 on August 10, 2014 by Petrov Gabriela.